Brock Burrum Saints have bounced back to the winners list with an impressive 23-point win away from home against Osborne. The Saints had lost the two previous matches by a point, and with the scores close at the last change they responded in fine fashion. They suffered a further blow earlier in the week when ruckman Matt Seiter was suspended for two weeks for an incident against Henty the previous week. 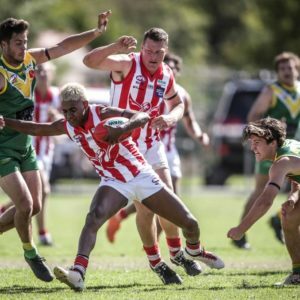 Henty submitted a video of a tackle laid by Seiter on star recruit Jared Brennan to the league, which handed it onto AFL Southern NSW for investigation. Youngster Aidan Johnson led the way with four goals and a best on ground showing, after Osborne had led by 12 points at quarter-time. Speedster John Roy Williams, ruckman Jeremy Luff and Kade Garland, with three goals, played a big part in the Saints’ crucial win. Osborne coach Matt Rava again led from the front, while four goals from Connor Galvin and another outstanding Duncan McMaster game ensured the Cats were in the game. Osborne has a massive local derby this week when it travels to Henty, while Brock Burrum will be hunting the double chance when it journeys to Jindera. 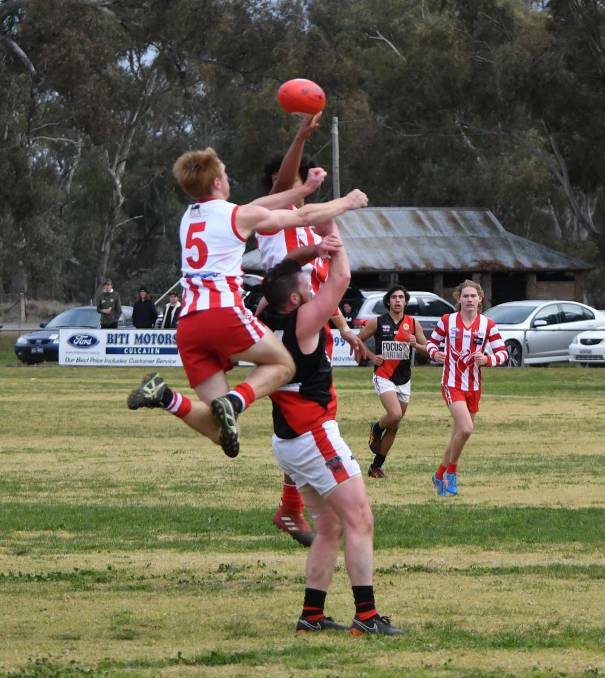 Henty completed the first round of home and away matches by trouncing Howlong to take out the Karl Jacka Shield by a margin of 80 points at Henty. The Spiders had no answer to the brilliance of star forwards Jarrah Maksymow (eight goals) and Damian Cupido (five goals). Former Brisbane Lions AFL star Jared Brennan played well, while excitement machine Daniel Cox made a return for Henty after missing five weeks with a hamstring injury. Henty used only 20 players after they had used the 38-player points allocation. The Swampies got permission from the league to play one short. Blake Williams was best for Howlong, with Jay Koehler playing his best game since returning from injury. Jackson Franks kicked two goals in his 100th game for the Spiders. 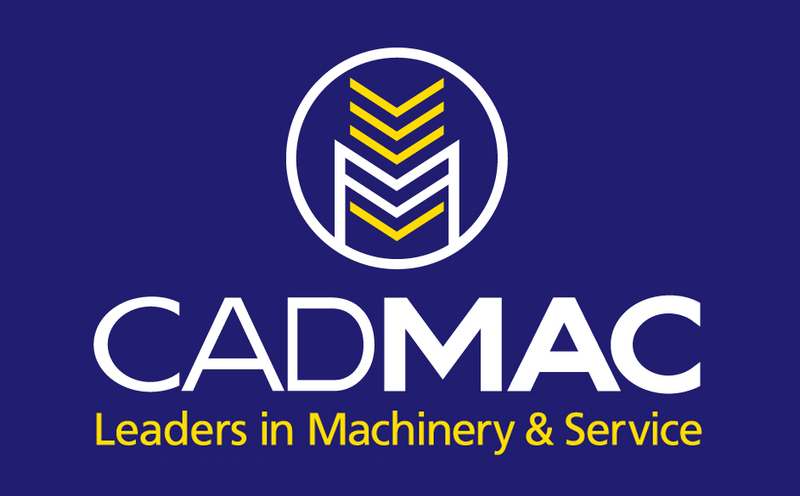 Culcairn kept its place inside the top six with a solid win over Lockhart. The Lions’ strong second half enabled them to coast home for a 57-point win at Culcairn. After an entertaining first half that had 15 goals scored, Culcairn shut the Demons down superbly to kick the only four goals in the second half. Jye Shields was in sparkling touch to dominate the midfield for the Lions, while Ben Gould and Dennis Pedemont both booted four goals. The Lions take on old rivals Holbrook at home this week in a vital encounter. Holbrook sits just half a game ahead of them. Jamie Clough continued his excellent form for Lockhart, with good support from the likes of Matt Endrez, Jordan Harrington and Zachary Sheather. Jindera has taken a hold on second place after finishing too strongly for Holbrook at Jindera to win by 30 points in front of a large crowd. Both sides had 21 scoring shots, however the Bulldogs’ six straight last-quarter goals put an end to the chances of the Brookers, who were inaccurate once again. The Doggies, despite leading goalkicker Trent Castles being well held by Luke Carman to three goals, had enough contributors to take the points. Holbrook has now failed to kick more than 10 goals in its last seven matches, with double figure goals being achieved just three times in the season. Josh Jones, Gus Keogh and Brock Knights were best for Holbrook, while Dan Middleton celebrated his 100th game with a solid four quarters and three goals for Jindera. Rand Walbundrie Walla Giants overcame a potential danger game against the Billabong Crows to win at Walbundrie by 25 points at the final siren. The Giants dominated the first three quarters to lead by 45 points before the Crows denied the Giants a bigger win by kicking four last-quarter goals. George Sandral and Timmy Austin were best for the Crows. With 15 more scoring shots, the Giants will rue a missed chance to build percentage. The home side was without coach Myles Aalbers, Mitch Thomas and Ryan Lavery. Brendan Simmonds was good in his return from injury. 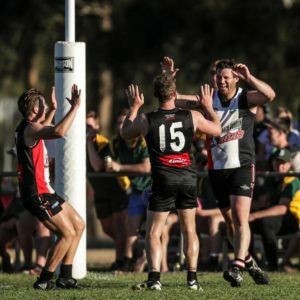 CDHBU has kept its finals hopes alive by defeating Murray Magpies by 25 points at Urana Road Oval in Lavington. Kade Rowe, Tim Cooper, Kane Mills and Brad Talbot ensured the Power got the job done. The win was the Power’s third in a row. CDHBU has a good chance of making it four wins in a row when it travels to Howlong. It is shaping up to be a season-deciding encounter for both teams. Alex Popko, Hayden Edwards and Josh Senior were among the Magpies’ best. Ash Murray was kept quiet with two goals.